"Long-term active investment can be beneficial not just for shareholders, but for the wider economy and society as well"
Investing offshore for sustained quality returns: is the approach justified? Selecting an offshore equity manager is daunting and the apparent simplicity of a passive strategy often seduces investors. Getting broad exposure to difficult-to-outperform global equity indices at low cost is often used to justify the allocation by South African investors. We argue that a long-term active approach, with low portfolio turnover to minimise transaction costs, has clear benefits for investors. A 2014 paper by Cremers & Pareek, entitled “Patient Capital Outperformance” sets this out compellingly. Their analysis of retail and institutional equity fund performance in the US between 1986 and 2013 revealed that only those active managers who trade infrequently outperform indices on average. According to their results, stocks held by patient, active institutions outperform by 2.2% p.a., with outperformance driven by “picking safe, value and quality stocks and holding on to those over relatively long periods”. Long-term active investing has wider benefits as well. As Andrew Haldane, Executive Director of Financial Stability at the Bank of England, argued in his speech on “The Age of Asset Management?” in 2014, shorter-term mandates and passive investing have been proven to increase asset correlations and amplify pro-cyclical swings, reducing risk-taking detrimentally. The perpetual nature of equity should make it an ideal source of long-term financing to households, companies and governments. When executed effectively, a long-term active approach can play a key stabilising, counter-cyclical role in stressed economic and market conditions. In other words, long-term active investment can be beneficial not just for shareholders, but for the wider economy and society as well. For South African institutional investors, we believe the selection of an appropriate actively managed global equity strategy is crucial considering the constraints of exchange control. Retirement funds, for example, are required to invest at least 75% of assets in the domestic market. South Africa is a small, cyclical emerging market largely dependent on exporting commodities, which in turn rely on the strength of global economic growth cycles. As responsible allocators of capital it is imperative to use the 25% available for offshore investment to complement your domestic assets and elevate risk-adjusted returns. Over the last 15 years, the offshore allocation in our multi-asset absolute return strategies has been to global quality companies. This approach has been a key contributor to delivering consistent real returns. This is embodied in the standalone Investec Global Franchise strategy which today has an exceptional long-term track record managed by our global research team based in Cape Town, London and New York. In assessing the ability of active quality investing to deliver long-term sustainable returns, we have studied how companies with a high return on invested capital (ROIC) mean revert1. We found quality companies are not only more profitable, generating a higher ROIC, but are also less prone to mean reversion (a downward move towards the long-term average, with negative consequences for share prices) or a decay (a long-term fall) in those returns over time. These companies typically utilise capital light business models, and have enduring competitive advantages, in the form of intangible assets such as brands, copyrights, licences and distribution networks. These competitive advantages create barriers to entry that protect quality companies from competitive threats and are typically found in the consumer staples, healthcare and technology sectors, as illustrated in Figure 1. Crucially, the domestic equity market in South Africa provides investors with limited exposure to these quality sectors. Source: Investec Asset Management analysis of FactSet and MSCI data as at 31 Dec 2016. Our research shows that investing in companies with sustainable top quartile ROIC is most likely to deliver strong long-term shareholder returns. 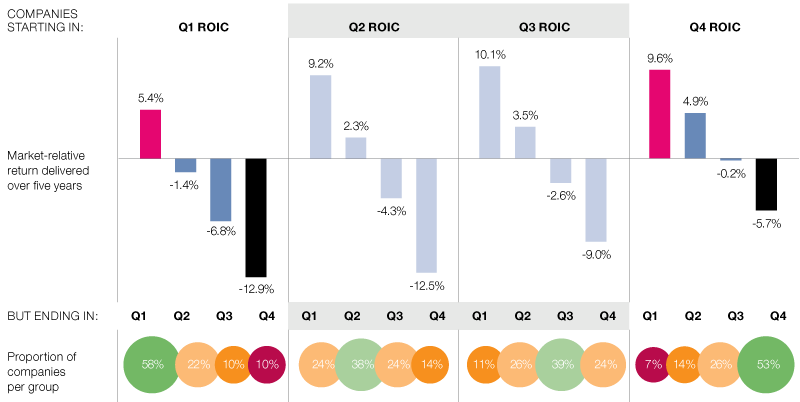 Over the analysis period, 58% of companies that started with top quartile ROIC were able to maintain that over a rolling five-year period. These quality companies delivered outperformance of 5.4% p.a. on average versus the market, as illustrated in Figure 2. Source: Investec Asset Management analysis of FactSet and MSCI data. Note: Quarters are cumulative as at 31 Dec 2016. Whilst the above quantitative analysis shows that a quality approach works, active qualitative research is essential to fully assess the sustainability of a company’s business model and competitive advantage, and therefore a company’s ability to sustain a high ROIC. A few headline quality metrics provide misleading results. These commonplace metrics may not necessarily show, for example, how strong a company’s competitive positioning and market share actually is, the impact of short-term currency movements, a firm’s dependence on the economic cycle, relationships with key stakeholders, or business tail risks such as regulatory risk or over-reliance on a single product or market. Aggressive accounting and financial engineering can distort earnings-based metrics, giving a false picture of the actual health of a company, and even fairly reported figures can be misleading. For example, high margins may reflect under-investment rather than pricing power or cost efficiency. Overall, different levels of disclosure, accounting treatments and calculation methodologies, as well as corporate activity leading to one-off gains or losses, all make cross-company comparisons difficult using solely a passive or quantitative based approach. An active approach also benefits from engagement with company management. Engagement helps to assess, and raise if appropriate, governance issues such as risk management, board balance, audit, remuneration and the rights of shareholders and other key stakeholders. As well as ensuring that capital allocation is fully aligned with stakeholders’ long-term interests, engaging with company management can also provide deeper insight into a company’s suppliers, customers and competitors, which in turn can help to generate new investment ideas. The concentrated portfolio and low turnover approach of the Investec Global Franchise strategy, together with the experience and resources of the Quality investment team, enable us to conduct in-depth proprietary research on each of the companies in which we invest. This gives us the necessary conviction in the sustainability of our companies’ ROIC and competitive advantages. It also gives us conviction in a company’s ability to avoid a permanent loss of capital, avoiding losses that are never subsequently recovered. We believe this differentiates us from the average competitor strategy. Low turnover does not mean no turnover. Over time, the consumer staples exposure of the portfolio has reduced from a high of nearly 70% in 2011 to approximately 35% today, with financials exposure increasing to approximately 10% and technology to more than 25%. This active management, in-depth quality focused research and gradual rebalancing of the portfolio has contributed to the stable ROIC profile over time, consistently high and at a significant premium to the wider market, as can be seen in Figure 3. Source: Investec Asset Management and FactSet, 30 April 2017. The above reflects the Investec Global Franchise strategy reweighted, excluding cash and cash equivalents based on a pooled vehicle within the strategy since inception. Data shown is based on companies held within the pooled vehicle portfolio; these metrics are not available at the composite level.The comparative index has changed to the MSCI All Country World Index (ACWI) from 1 October 2011. The ROIC is different from the actual strategy performance and past performance is not a guide to the future. Investments carry a risk of capital loss. Source: Investec Asset Management and FactSet, 30 April 2017. Data is run monthly and is based on a pooled vehicle within the Investec Global Franchise strategy. This data is not available at the composite level. The portfolio’s declining exposure to consumer staples in recent years (Figure 4) has resulted less from a negative view on this sector and more from increasingly attractive quality ideas emerging elsewhere, in particular the technology sector. One such example is global network security vendor, Check Point Software Technologies, in which we initiated a position in 2015. The network security industry has been growing by high single digits in recent years, a trend which is anticipated to continue amid rising instances of cyber attacks and data breaches. Check Point is one of the leaders in the industry with a dominant position providing firewall software solutions to large enterprise customers, including all Fortune and Global 100 companies. Organic growth combined with smart capital allocation has resulted in attractive double digit long-term earnings growth, and high margin software sales combined with a capital light business model have resulted in extremely high returns on invested capital. Its subscription based model means that cash is received up front and revenue is deferred on the income statement over the life of the contract. As the company grows, cash flow runs ahead of earnings, resulting in one of the best cash conversion profiles in the market. These quality characteristics and structural growth dynamics, together with an attractive valuation, are exactly what we look for in a stock for our Investec Global Franchise strategy. Our active approach, driven by in-depth proprietary analysis, not only helps us uncover new ideas and gives us conviction in individual stocks, but also aids us in understanding the sensitivities of the existing portfolio to macro events, themes and potential risks. A common misperception is that quality stocks are effectively bond proxies given the long duration, visibility and consistency of the cash that they generate, and are therefore susceptible to poor performance in an environment of steepening yield curves and rising interest rates. We again take comfort here from the detailed research we undertake. Our risk analysis has shown that the performance of ten-year US Treasuries explains less than 6.4% of the performance of the Global Franchise portfolio, with 93.6% of the performance therefore attributed to other factors such as their consistent free cash-flow growth and sustainable high ROIC. A good example is payment network operator, Visa. Not only is Visa exposed to structural growth trends, such as the shift from cash and cheque to card-based payments, and self-help opportunities through its integration of Visa Europe, but it should also benefit from a reflationary environment, should that continue. As Visa takes a percentage fee on consumer debit and credit card transactions, its revenue would benefit from consumer price inflation. Given costs are mostly technology related, the inflationary pressures are significantly less on the cost side, leading to growth in revenue and improving margins through greater operating leverage. What does this mean for South African institutional investors? Due to regulatory constraints we realised more than 15 years ago how important it is to use the limited allowable offshore allocation optimally in order to maximise the risk-adjusted returns for our investors. As shown in Figure 5, not only has the Investec Global Franchise strategy outperformed the broad market, as represented by the MSCI All Country World Index (ACWI), our refined research process has contributed to the strategy outperforming ‘smart-beta’ quality indices such as the MSCI ACWI Quality Index. We believe this is the result of our unique research process which is focused not only on identifying those companies that have historically been high quality businesses, but more importantly identifying those quality businesses where the sustainability of the future returns and cash flows is high. Source: Investec Asset Management and Bloomberg as at 30 April 2017. Shaded areas highlight periods of market correction. All returns are gross of fees. While the long-term return profile of the Investec Global Franchise strategy is exceptional, we believe the diversification benefits this strategy offers South African investors is just as important in order to enhance the risk-adjusted returns for retirement savers. Please see Table 1. Source: Investec Asset Management and Bloomberg as at 30 April 2017, all returns are gross of fees. While a passive global equity strategy might be the easiest solution, investors need to approach their offshore allocation with care and make their 25% work optimally for members to enhance the risk-adjusted returns. For more than 15 years, we have successfully been investing in our carefully selected portfolio of global franchise companies to diversify away from the cyclicality and volatility our investors are exposed to through their domestic assets. 1 We analysed the top quartile of companies in each MSCI All Country World Index sector, as measured by ROIC, and calculated the average fade rate over rolling five year periods, using FactSet data between 1988 and 2016. Please refer to our 2016 paper “Equity investing the Quality way” for the full methodology. This document or any of its content may not be in whole or in part, be copied, modified, distributed, retransmitted, redistributed, or released to any third party. The user represents and warrants that it will not use or permit the use of the document or any of its content for any purpose other than authorised internal use and warrants that it will not, without the prior written consent of Investec Asset Management, directly or indirectly redistribute, or knowingly facilitate redistribution of, all or any portion of the document. All information and opinions provided are of a general nature and are not intended to address the circumstances of any particular individual or entity. We are not acting and do not purport to act in any way as an advisor or in a fiduciary capacity. No one should act upon such information or opinion without appropriate professional advice after a thorough examination of a particular situation. We endeavour to provide accurate and timely information but we make no representation or warranty, express or implied, with respect to the correctness, accuracy or completeness of the information and opinions. We do not undertake to update, modify or amend the information on a frequent basis or to advise any person if such information subsequently becomes inaccurate. Any representation or opinion is provided for information purposes only. Past performance of investments is not necessarily a guide to future performance. Fluctuations or movements in exchange rates may cause the value of underlying international investments to go up or down. This is not a recommendation to buy, sell or hold securities. Investec Asset Management will not be held liable or responsible for any direct or consequential loss or damage suffered by any party as a result of that party acting on or failing to act on the basis of the information provided by or omitted from this document. This document may not be amended, reproduced, distributed or published without the prior written consent of Investec Asset Management. Investec Asset Management is an authorised financial services provider. Issued by Investec Asset Management, June 2017.